After about 8 days in the Rainbow Six: Siege closed beta, I think I’ve played enough of it to provide a decent opinion on what it was like, and hopefully what it’ll transition into by the time it’s a finished product. With that said, if you have absolutely no clue what R6: Siege is, it’s a somewhat tactical FPS that is being developed by Ubisoft Montreal and releases on December 1st, 2015. Siege takes a step away from the current “twitch reflex” style of FPS that’s currently monopolizing the first-person shooter market, and instead forces you to use a more tactical approach combined with some teamwork – if you want to win, that is. You can still try to Rambo your way through matches, but you’ll probably just end up dying or getting your team killed. As you’ve likely been shown in various gameplay videos, Siege implements a really kickass destruction mechanic and almost any non-concrete (or brick/metal) wall can be destroyed or shot through with some really awesome effects. Not much beats blowing a 12″ hole in the center of a wall with a shotgun, or leaving bullet holes that you can actually see through! This awesome mechanical creates a new level of tactical gameplay that really makes you stop and think before moving through a hallway – or when you’re setting up possible defenses. So far I am really impressed with R6: Siege, the graphics are good, the optimization is good and the gameplay itself is really fun and actually pretty addictive. 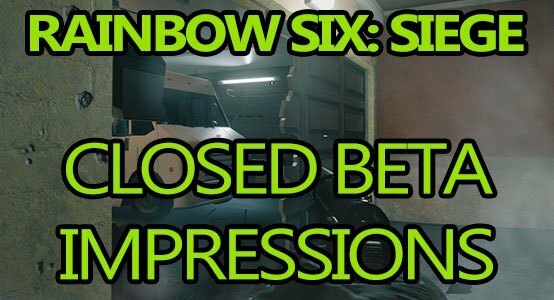 But, Siege does have it’s downsides in the current closed beta build, the biggest complaint I’ve seen (and have myself) is that the riot shield + pistol combination is insanely OP – that’s not really a bad complaint to have either, because it’s something that can be, and will be fixed before the official launch. Another “beta style” complaint I’ve noticed is about the servers and finding matches, which is another flaw that I think is going to be fixed prior to launch. There are 2 game modes in Siege, 5v5 Multiplayer and Terrorist Hunts which can be tackled with a team or solo. The 5v5 multiplayer is broken down into sub-categories, and right now there are 2 different scenarios, “Secure” and “Bomb”. The two scenarios have pretty much the same basic idea: get to the objective, or defend the points from the attackers. I’m sure there will be different game modes in the official release, but for now they’re pretty much the same thing and you have no choice over which one you’re put in, which is something that I hope changes. One thing that I would definitely like to see is some kind of hostage rescue situation, or something along those lines. Terrorist hunts are pretty straight up and if you’ve played a Rainbow Six game before, then you’ll know what it’s all about – only this time the AI has a few more tools at their disposal. When you first start a terrorist hunt, the enemy AI will already have some defenses up, but as you’re scoping things out and trying to find the best way to attack, the enemy will be setting up even more defenses in preparation for your inevitable assault. 1 tip though, if you hear breathing like it’s through a gas mask and a faint beeping… run… Because unless you spot a bomber first, it’s probably too late. Having specific characters to pick from seems to be the way that FPS games are going these days, and just like Black Ops 3, R6 Siege has its own list of “operators” that you unlock with some in-game currency and then customize. There isn’t just one big list of operators to choose from though, instead they are broken into 2 classes – Attack and Defense. They’re also broken down by which CTU (Counter-Terrorism Unit) they come from, which affects the types of weapons you can equip them with. Each of the current 13 operators has their own unique ability, armor type (light, medium, or heavy) and movement speed. I might be stating the obvious here, but you can only use attack operators when you’re taking part in a terrorist hunt or when you’re on the attacking team in a 5v5, and the defense ops are currently only used in 5v5 matches while defending. Where Rainbow Six: Siege differs from other modern FPS games like Call of Duty or Battlefield lies within its unique “preparation” and “action” phases. At the start of each round, you have about a minute during the preparation phase to either set up your defenses or use a small drone to scout out the objective(s), depending which team you’re on. It might sound boring, but Ubisoft did a great job of not only making this minute extremely crucial, but also fun. On the defense team, you will be laying traps and fortifying the area with things like door/wall barricades, electronics jammers, and wall reinforcements that can only be breached by 1 specific assault operator. The action phase is all about executing your plans and preparing for an inevitable firefight with the opposing team, which is when things are going to start exploding and walls, doors, and windows will be splintered into tiny fragments by high-explosives. The first minutes of the action phase are usually pretty slow, the attacking team will be setting up their offensive on the outside of whatever target building, while the defense team is finding a corner and pitching a tent. This is usually a really tense situation for both teams as there is a chance that no one will know where the enemy is until it’s too late. All-in-all, Rainbow Six: Siege is turning out to be a really satisfying and really tactical first-person shooter, even if it does have a few flaws in it’s current closed beta build – but that’s what a beta is all about, the bugs. It takes a massive step away from the current twitch reflex style that has monopolized the FPS genre, and throws you into a team-based, slightly slower, tactical experience where every step could prove fatal. If you’re looking for a game that is different than your typical Battlefield or Call of Duty iteration, then R6: Siege might be what you’re looking for. The closed beta lasted from September 23rd to October 4th and it’s been great beta to take part in and help test. For those who missed out on your chance to hop into the closed beta, Rainbow Six: Siege will release on December 1st, 2015, and it’s definitely a game that I would recommend grabbing for yourself.